I think the fail being pointed to is something only a gamer would get. When an X-Box 360 dies, it's characterized by the "red ring of death" - a red light that spreads slowly around the power button, allowing you a precious few seconds to extract your disk before it's permanently damaged. 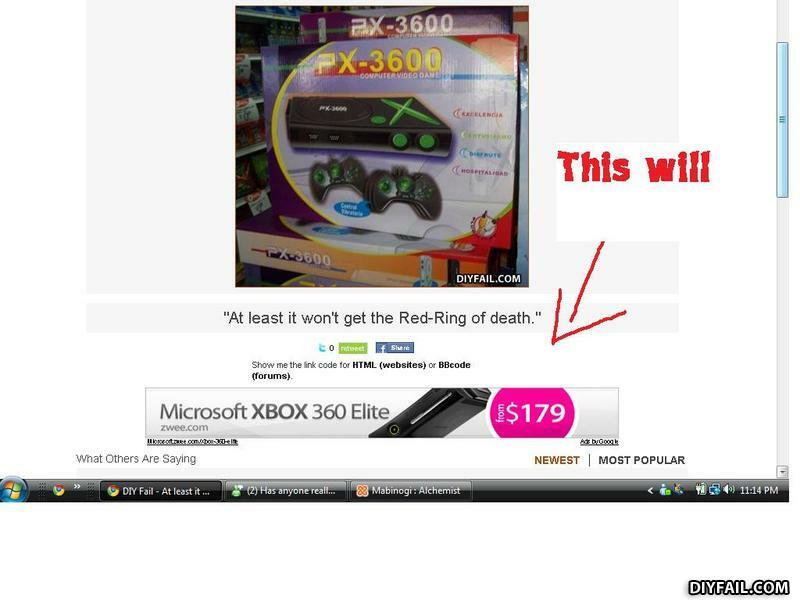 The X-box 360 is hopelessly flawed and now boasts a failure rate of more than 50% in the first 2 years. In other words, within 2 years of being bought more than half the X-Boxes sold will crash. Microsoft's answer? No. They didn't fix the problem. The new PX-3600 just removed the ring of death so you won't know your system is failing until it's dead and taken your game with it. In this case, the fail is Microsoft. And the gamers for not buying a PS3 which only has a failure rate of about 4%. No, the Xbox is the fail. Period. OH I SEE THE FAIL, taking pics from the same site is a fail.